Should this have been deliberate? Shaun Burgoyne's 15 contested possessions is the most he's recorded in a match since Round 14 against the Crows in 2017 (17). He also sharked five Port Adelaide hitouts, to dominate the stoppages and set up this win for the Hawks. Port Adelaide have won the clearances 3927, including centre clearances 12-5 in today's match, but have managed just five more points than the Hawks from this source in today's match. Hawthorn have had three shots at goal to ice this game, but have kicked two behinds and exPower player Jarman Impey put his shot out on the full. 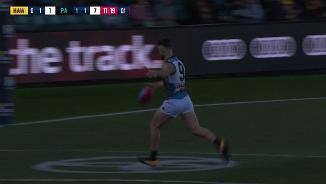 Robbie Gray gets his fourth goal to take back the lead for the Power. He has also launched the only goal for the Power that has come from a stoppage in today's match. Only Jarryd Roughead (nine) has more score involvements than Gray's seven. Hard to go past Shaun Burgoyne as one of the best on ground in Sir Doug Nicholls Round for today's match. He has 23 disposals and a gamehigh 14 contested possessions and seven clearances to go with a goal, six score involvements and 13 pressure acts. Port Adelaide have recorded 13 scores from 32 inside 50's compared to 16 scores from 52 inside 50's for the Hawks. The Power average a score from 44 per cent of inside 50's in 2018, the ninthbest percentage in the AFL. Jarryd Roughead and Luke Breust have eight and six forward half pressure points respectively this quarter. Port Adelaide have five forward half pressure points combined in the final term so far. 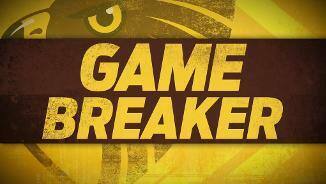 Hawthorn took 55 marks to the Power's eight in the third quarter. This differential is the largest gap to occur in this category since the last quarter of Richmond's Round 21 clash against Collingwood in 2015 (5912). Port Adelaide have been able to retain possession from 54 per cent of their kicks inside 50 in this match, compared to 42 per cent for the Hawks. However in overall forward half kicking efficiency they are going at just 50 per cent. Hawthorn have taken 21 Intercept Marks in this game so far to Port Adelaide's 13, and scored 3.1.19 to the Power's 2.0.12 from these possession gains. Liam Shiels has been outstanding for the Hawks in the third quarter. He has a gamehigh nine disposals, four contested possessions, three inside 50's and one score assist as well as three score involvements and three marks. Port Adelaide have won the clearance count 104 this term, and Paddy Ryder has as many hitouts-to-advantage as Ben McEvoy has hitouts. Yet the scores from clearances this quarter is locked at 0.1.1 apiece. After a very quiet second term, Robbie Gray gets his third goal of the match to lead all players on the ground. Since he debuted in 2007 no Power player has kicked more goals against the Hawks than his 19. Hawthorn have quite literally hit the ground running in the third quarter. They have won 174 uncontested possessions early in the quarter. Port Adelaide lead the AFL in uncontested possession differential this season (plus 40 per game). Justin Westhoff was best on ground in the first half for the Power with a teamhigh 17 disposals, six contested possessions, six uncontested marks, five clearances as well as 11 pressure acts and three score involvements including his one goal. Tom Mitchell has kicked the only goal of the game to be scored at the Northern Terrace end of the ground. He also leads all players with 21 disposals and 15 uncontested possessions, to go with a teamhigh 273 metres gained and seven marks. After losing the scores from intercept possession battle by four goals in the first term, the Hawks turned it around in the second term to win that differential by four goals, with two of those goals being launched by Shaun Burgoyne. Paddy Ryder has been incredibly important for the Power in the first half. He has 17 hitouts, four more than both McEvoy and Ceglar combined, and four toadvantage to help the Power to a 21-14 clearance count lead. Tom Mitchell has kicked two goals in this match, both from 50 metre penalties. 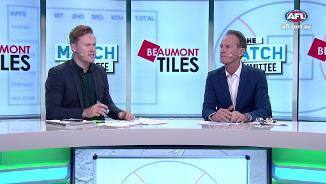 Port Adelaide have conceded three goals from 50 metre penalties in their nine matches prior to today, the equalthird lowest total in the AFL in 2018. Paul Puopolo's goal was the first from general play for the Hawks, after Port Adelaide kicked 4.1.25 from this metric in the first term. Hawthorn average one more goal per game than their opponents from general play in 2018, ranked third in the AFL. After losing the centre clearance count 51 in the first term, the Hawks get the first clearance of the second term which leads to Ben McEvoy getting the first goal of the quarter. Charlie Dixon was outstanding for the Power in the first term. He leads all players with four inside 50's, four score launches and two goal assists, as well as leading all Power players with four contested possessions and 190 metres gained. After giving away the ball that lead to the opening goal, James Frawley has rebounded well. He recorded four spoils, and won two of his three defensive oneon-one contests to lead all Hawks players in these two categories. The Power have retained possession of 71 per cent of their kicks inside 50 so far this term, compared to 44 per cent retention for Hawthorn. Essendon lead the competition in this metric retaining possession from 51 per cent of kicks inside 50 in 2018. Tom Mitchell gets the goal to steady the tide after Justin Westhoff gave away a 50 metre penalty. He leads all Hawks with seven disposals and six uncontested possessions despite wearing a pretty close tag from Sam PowellPepper. Just like that the Power have kicked three goals from forward half intercepts, two of them through Robbie Gray. The Power average 24 points per game from forward half intercept possessions, the seventhlowest average of any side in the AFL in 2018. Shaun Burgoyne has been reported for a high tackle on Jared Polec, his second free kick against in under a minute. 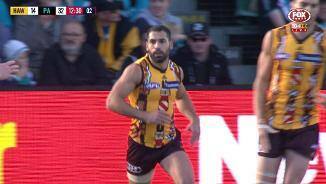 Burgoyne has not been suspended since 2013. Shaun Burgoyne has come to play today, leading all players early in the first term with five disposals, four contested possessions and two clearances already. 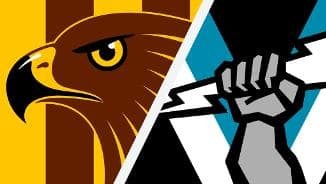 The last time the Hawks and the Power faced off in Round 11 last year, Port Adelaide conceded zero points in the first quarter for the first time in their club's history, and conceded the lowest first half score in their history (0.3.3). Hawthorn has scored 57 points as a result of turnovers caused by Luke Breusts pressure acts this season, ranking him No.1 in the competition. He also ranks first for groundballgets and second for tackles inside 50, and third for scoreboard impact. Port Adelaide has scored from 20 per cent of its defensive midfield chains in 2018, the highest scoring rate in this zone of any side. Hawthorn has conceded inside 50's from 34 per cent of its opponent's defensive midfield chains, ranked 18th in the AFL. Dougal Howard (95) and Tom Jonas (68) both rank inside the top 10 players in the AFL for spoils this season. Among those top 10 players, they have the secondhighest (78.9 per cent) and highest (79.4 per cent) spoiling efficiency ratings respectively. After ranking outside the top 10 teams for forward half possession gains and points from this source in 2017, Hawthorn rank fourth in both metrics this season averaging 34 points per game from 27 forward half possession gains per game. Welcome to University of Tasmania Stadium for the Hawthorn v Port Adelaide Round 11 clash. HAWTHORN has snapped a three-game losing streak, pipping Port Adelaide by three points in a dogged AFL clash in Launceston. The lead swung both ways in a tense final term, but the Hawks' biggest gun stood up on Saturday afternoon when it counted in the 9.10 (64) to 9.7 (61) win. Port Adelaide kicked back-to-back goals to go ahead with about 10 minutes to play. But Hawthorn skipper Jarryd Roughead put his side back in front with a crucial major in the 24th minute of the last term. The Hawks' scrambling defence did the rest. 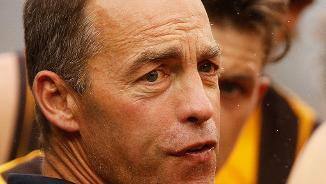 "Just to get the win is really pleasing for us," Hawthorn coach Alastair Clarkson said. 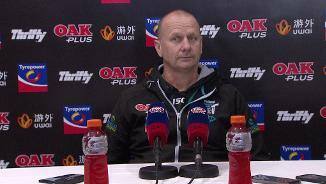 "We’ve had a pretty scratchy month, lost three games on the trot coming into this game and it was pretty important we won today just to keep us in touch with the eight. "Hopefully we can build our season post the bye." 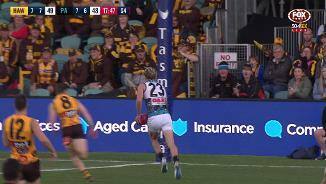 Hawthorn had the chance to ice the game but several shots hit the post and ex-Power player Jarman Impey kicked out on the full. Ball magnet Tom Mitchell played a leading hand, with two goals and a game-high 28 touches. Shaun Burgoyne was also a standout with 26 possessions, but might have some questions to answer at the tribunal after being placed on report for rough conduct in the first quarter. Early, it looked as if the Hawks were set for just their second loss at Launceston since 2012. 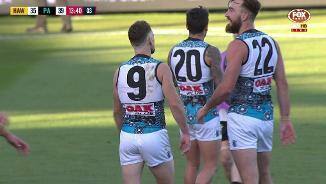 Port Adelaide kicked the first four goals of the match to open a 26-point lead at quarter-time, with Robbie Gray and Jack Watts finding plenty of space inside 50. But the Hawks hit back with four unanswered goals in the second to level the scores at 33-33 at the main break. "It was an ugly game, I thought. 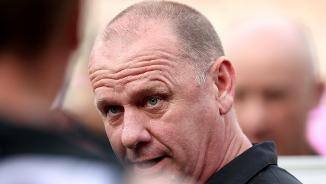 A really ugly game," Port Adelaide coach Ken Hinkley said. "We let it slip. 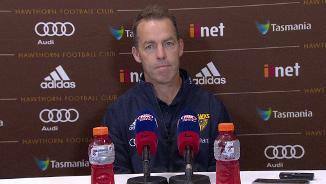 We had the game where we wanted it to be played and to Hawthorn’s credit they were able to find a way back into it." The Hawks didn't hit the lead until early in the third quarter and took a slender seven-point margin into the final term. Gray, who had four goals in a losing side, kicked the major in the last quarter that put Port Adelaide ahead. 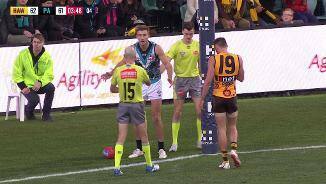 But Roughead stood up, kicking his only goal of the match. Both sides will leave Launceston without any major injury concerns after Port coach Ken Hinkley allayed any fears regarding a significant injury to key forward Charlie Dixon, who spent time in the rooms having his knee taped during the second half. 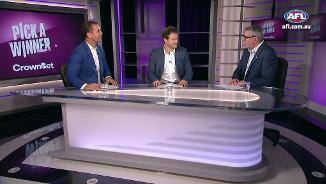 Port Adelaide is back home but faces a tough task when it takes on Richmond under lights at Adelaide Oval on Friday night, while the Hawks can take a well-earned rest as they enter the bye round with a 6-5 record.